Together, Batman, Superman and Wonder Woman™ form an epic alliance of DC Super Heroes, often referred to as “The World’s Finest Trinity”. Individually, they are some of the most powerful characters in the comic book universe, and united, they are virtually unstoppable. Fans around the globe have long celebrated their bond and their legendary stories. 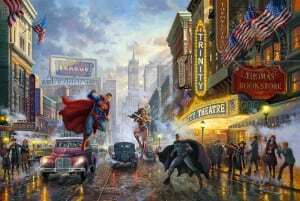 The Thomas Kinkade Studios is proud to present Batman, Superman, and Wonder Woman: The Trinity I, our first Limited Edition Art release paying homage to classic DC characters. In this scene, the trio is preparing to fight an enemy in a place that evokes iconic memories from each hero’s personal history. From arch enemies and beloved friends to important dates, we invite you to explore the hidden salutes we have included in this painting. 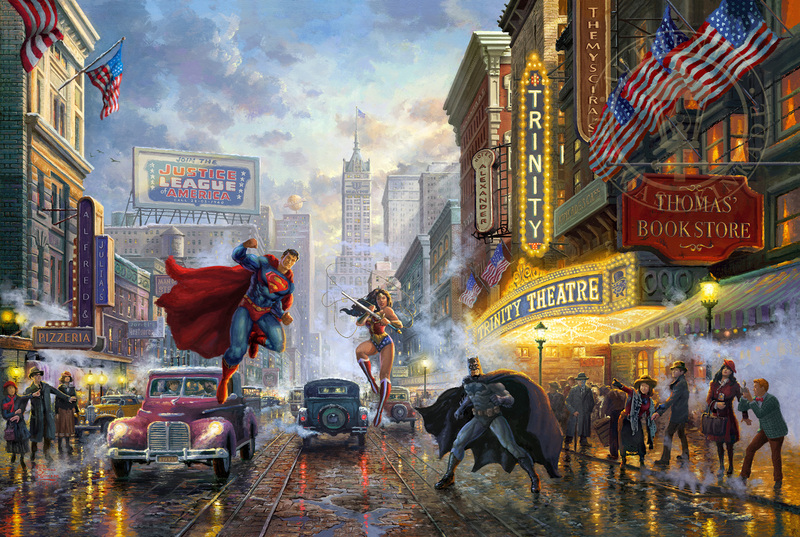 Batman, Superman, and Wonder Woman: The Trinity I is the first collaboration between DC Comics and The Thomas Kinkade Studios. This Limited Edition Artwork showcases tributes to important people in the lives of Super Heroes, including building signs dedicated to Jor-El and Lara Lor-Van – Superman’s parents on Krypton, Thomas Wayne – father of Bruce Wayne, Commissioner Gordon – Batman’s chief ally, and Alfred Pennyworth and Julia Pennyworth – Batman’s faithful butler and his daughter. In the work, Jimmy Olsen and Lois Lane are seen observing from the right side of the street, while the Daily Planet headquarters looms in the background. Also, look for Super-Villains who abound in this artwork. Can you find the hidden references to The Penguin and The Joker, along with a cameo appearance by Two-Face and the homage to Gotham City? The Hotel Alexander is named after Superman’s nemesis – Alexander “Lex” Luthor. The villain is also referred to on the political campaign sign that adorns the water tower in the background. The Trinity Theater marque pays tribute to the legendary alliance between Batman, Superman and Wonder Woman. Themyscira’s is a nod to the island home of Wonder Woman – who was known to her Amazonian people as Princess Diana of Themyscira, and in her secret identity as Diana Prince. The phone number on the “Join the Justice League” billboard refers to the comic book in which the Justice League first appeared – The Brave and the Bold #28. The 3B on the street car is a hidden reference to Clark Kent’s apartment number, while the words “Man of Steel” are discreetly positioned behind Superman’s flowing cape. Thomas Kinkade – the founder of our Studio – was a life-long DC Comics’ fan – and “Kinkade’s Café” is a nod to his intense love for comic books and the artistic legacy we continue in his memory. I purchased the largest piece and it looks great on my wall. There are a lot of references and secret details to look for in this piece. I cannot wait until the second one comes out and see what is next to look at!! !